When I was the Lead Artist on Dungeons and Dragons Online I was doing a number of tasks from concepting, scheduling, going to meetings and working with some of the tech artists on prototyping dungeons. I had a newer artist on my team who didn't have much experience and was eager to learn. 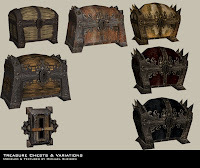 I remember I had asked him to create a series of treasure chests that would be used all throughout the game. He just rolled his eyes and asked me if one of the interns could do that kind of work. He just wanted to work on characters or "something cool." I didn't have time to argue with him, so I just gave him some other task. I learned early on while working on Asherons Call, that if you are going to be creating a piece of art that will be seen very frequently, it better look good, no matter how small of an object it is. I decided to model & texture the treasure chests myself. It was a fun task and I take pride in every single art asset that I build no matter how small. These are just painted textures, no bump or specular maps. I can't remember the poly count but I know it was low.